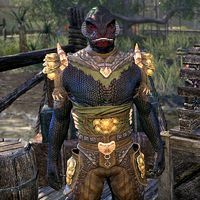 Bolu is an Argonian Naga of the Naga-Kur tribe who can be found in Lilmoth. He is looking for talented warriors to perform Death-Hunts. After reading the Death-Hunts Await note, he can be found near the Guild Hall. "You have seen my postings? Word of Xul-Motas staked across Murkmire with dagger and nail. You come for the Death-Hunts." I saw the note. What exactly are these Death-Hunts? "I reveal the obvious. They are hunts for death. Or rather, deadly things. My tribe puts out the call for warriors to gather and pursue Xul-Motas. That is my purpose here." So I should come to you if I want to join a hunt? "Truth. Varo Hosidias keeps up on our needs as well. Come to either of us and you may join those who seek out death. You are here now. Is death what you seek?" These deadly things you mentioned. They're monsters? "Death comes in many forms, monsters chief among them—no matter the number of legs. What you face depends on the needs of the Naga-Kur. No matter what we ask of you, you will be tested." "Part of Cyrodilic Collections. A warrior past his prime. Brokers jobs in Lilmoth now. He gets his cut for those he sends my way. Regardless of whether they survive." I'm interested in one of your Death-Hunts. "Good. I reveal the Xul-Mota each day. You gather your warriors do as I ask. If you survive you will have the respect of the Naga-Kur and the spoils." "I say sincerely. What I offer will no doubt lead to your death, but the battle will be glorious! Will you accept a challenge from the Naga-Kur tribe." "I present a task, kuuda. Though help is the last thing the Naga-Kur requires, I offer you the honor of assisting my tribe." "I offer a test of spirit and skill that will push you to your limits and perhaps lead to your swift and painful death. There is no greater honor for a warrior of the Naga-Kur!" "When the hunt ends, the celebration begins. Is a celebration in order, friend of the Naga-Kur?" "I say true, you have returned. Now you say true. Did you succeed?" "The wind carries you back. Now speak true and say how you fared." "You look like the wamasu that just caught the dragonfly. " "No other jobs right now, but I'm not going anywhere. I'll yell if I need you." "When fruit falls from a tree, the wise hunter seeks sustenance in other places. Be a wise hunter and return later." "I state the following fact. Your assistance is not required. Return later." "When the river runs dry, it's best to look elsewhere for water. Come back later." "No tasks for you. Come back later." Tell me about the necromancer, Baxilt-Gah. "Unusual for Saxhleel to take up magic. Even more rare for one to deal with the dead. Argonians exist in the present. Past is dead. Dead is dead. Only the Veeskhleel commune with the dead, and Baxilt-Gah is as crazy as the rest of the Ghost People!" "Bok-Xul is located to the west. Words mean "Bowl of Death" in Argonian tongue. It's an ancient ritual circle, all jumbled rock and stone ruins. Very dark place. Very evil. Just perfect for a necromancer like Baxilt-Gah." Can a necromancer really be killed? "Everything dies. Just some things have a habit of returning from the dead. Very disconcerting. Necromancer might come back. Who can say? Perhaps you can kill him dead-dead-dead. Doesn't hurt to try. Unless Baxilt-Gah kills you first." And what tribe do you represent? "I am a skilled hunter of the Naga-Kur. You would say Dead-Water in your tongue. Our village of ruthless warriors lies far to the north and west, in the deepest part of the marsh. The Naga-Kur are a proud, fierce people who distrust outsiders." Then why are you asking me for help? "I reveal a big secret. Skilled hunters use every arrow in their quiver. Even the bent and broken ones. Now the Naga-Kur need help in Bok-Xul. A perfect task for an outsider. Just beware the necromancer. Baxilt-Gah is as dangerous as a hungry viper!" "Sacred grave-stakes. The necromancer of the fen stole grave-stakes to use in foul rituals at Bok-Xul. Now noxious gas spews from desecrated burial sites, and the necromancer uses cherished ancestors to power his evil spells." "Go to Bok-Xul and retrieve the stolen grave-stakes. Also, make sure to kill the necromancer Baxilt-Gah. Then take the grave-stakes and return them to swamp. Just place them where rot gas spews. That will set things right again." I'll kill this necromancer, find the grave-stakes, and return them to their rightful place. "That way. Your task awaits, outsider." Why do you want me to recover the grave-stakes?/What's so important about the grave-stakes? "These are Naga-Kur grave-stakes. Each represents a member of the tribe who rejoined the Hist. They do not belong in the hands of a foul necromancer. That is an abomination! I ask urgently. Recover the grave-stakes and return them to the swamp." "Every Naga-Kur carves a grave-stake. The process is deeply personal and the finished stake tells the story of the carver's life. When an Argonian dies, the grave-stake marks where the body fell and serves as a remembrance until the swamp claims it." So what does the necromancer get out of stealing these grave-stakes? "Baxilt-Gah wants the life energy that clings to the stakes. Powerful stuff! Provides energy for his abhorrent rituals. The necromancer disgraces the memories of our tribe members and disrupts the natural order of the swamp. This is a bad thing." After killing Baxilt-Gah and placing the grave-stakes, Bolu can be spoken to to report the success. I killed the necromancer of Bok-Xul and returned the stolen grave-stakes. "I state a fact. Baxilt-Gah is a necromancer. Death is a hindrance, nothing more. Still, with the grave-stakes returned, we can once again remember our ancestors. The Naga-Kur would thank you, but they dislike outsiders. So take this reward instead." "Carnivorous plants. The necromancer of Bok-Xul corrupts harmless plants. Turns them into monsters. They spread from the ritual site, endangering the tribe's hunters and gatherers. I need someone to get to the root of the problem and cut it out." You need me to destroy some plants? "I sigh at the innocence of outsiders. Killing plants isn't enough. You must burn the heart-roots! Go to Bok-Xul. Burn the corrupted heart-roots and kill the necromancer, Baxilt-Gah. Then the tribe will be safe. For a while." I'll kill the necromancer and burn the corrupted heart-roots. He can then be asked questions about the task. "You appear confused. Must I explain the task again?" Tell me more about these carnivorous plants. "I will explain, so listen well. The necromancer's evil magic corrupts the soil, corrupts the roots. It turns plants into monsters. The carnivorous plants spread out of Bok-Xul and endanger the tribe. Only way to kill the plants is to burn the roots." And the roots are in Bok-Xul? "Where else? That's where the necromancer performs his vile rituals. That's where the heart-roots grow. Remember. Baxilt-Gah is an evil necromancer. Evil necromancers can be killed, but they have a bad habit of returning. Like weeds, they are!" I killed the necromancer and burned the corrupted heart-roots. "I express genuine surprise and admiration. Whether the necromancer stays dead, hard to say. But very good that roots were destroyed. The Naga-Kur do not hug or show any kind of affection toward outsiders. Instead, take this reward and go away." "I impart the following details. Naga-Kur warriors assaulted the necromancer's fen before I sought outsiders to aid us. My egg-siblings fell before Baxilt-Gah's vile magic. If the remains are not recovered, the necromancer will use them against us." "First, kill the necromancer. He is a blight upon the land. Then recover the bones of the fallen Dead-Water warriors. They need to be fashioned into weapons so they can be used in battles once again. Anything less would dishonor their memories." I will kill the necromancer and recover the bones of the fallen. He can then be asked about the weapons. You make weapons from the bones of your dead warriors? "Not just from warriors. All tribe members. My dagger was carved from the leg bone of my egg-mother, and she was a cook! It allows the departed to keep fighting. To help the tribe even after they die." So these bone weapons hold the spirits of your dead tribe members? "No. That would be cruel. Our spirits go to the Hist when we die. We could not bind the spirits to the bones, even if we wanted to. We're not necromancers! Making use of bones honors our dead and gives purpose to their bodies after they die." Does your tribe usually seek help from outsiders? "I reveal an embarrassing truth. No, the Naga-Kur despise outsiders. But a good hunter makes use of every available tool and weapon. You happen to be a perfect tool." Why do you need the nightbloom vines? "I tell you a secret. Our egg-tenders and tree-minders use nightbloom vines for a variety of purposes, none of which I know very much about. When the tribe runs out, though, bad things happen." "Famine, sickness, strange weather, swarms of insects. One of those calamities. Maybe all of them. Who can say? I am not an egg-tender or tree-minder. Now go get the vines." "I respond with truth. No one knows. Miregaunts have been here as long as Argonians. Maybe longer. Some think they are the wrath of Murkmire. Others that the Hist sends them to teach lessons. Worst is Walks-Like-Thunder. Very bad. Very dangerous." And you're all right asking me to kill it? "Miregaunts are part of the land. Strike one down, it comes back later. Like stink weeds or swamp grass. Besides, I do not expect you to kill Walks-Like-Thunder. Though I hope to be wrong. We really need the nightbloom vines." Tell me about your tribe. "I am a skilled hunter of the Naga-Kur. You would say Dead-Water in your tongue. We are ruthless warriors. Our village lies far to the north and west, deep in the marsh. We are proud. Set in our ways. The tribe has no love of outsiders." And what do you think of outsiders? "I reveal my opinion. I am more traveled than my egg-kin. I see uses for all. The Naga-Kur need someone to go to the Hollow, and I think that's a good use for an outsider! Just beware Walks-Like-Thunder. It will fall on you like a toppled tree." Once you have destroyed Walks-Like-Thunder and collecting the nightbloom flowers, you can return to Bolu and give them to him. "I speak truth. I expected the miregaunt to break your bones and leave your body to sink into the swamp. A pleasant surprise that you survived. And that you succeeded.\n\nHere. The Naga-Kur thank you for your service."